In the middle of the section, many students find themselves unsure as to whether or not they will finish all of the passages on time. Although, the exam proctor will tell you when to begin and end the section, you are in charge of pacing yourself on each individual reading passage. For the SAT, aim to finish each passage and its corresponding questions within ten to thirteen minutes (standard time). For the ACT, aim to finish each passage and its corresponding questions within eight or nine minutes (standard time). When you begin a passage, write down your start time at the top of the page. Once you finish the questions for that passage, write down your stop time; as long as your time is within the aforementioned time allotments, you will be on track to finish the section on time. Also, budgeting your time on each individual passage is even easier with a digital watch, as they are simpler to read than analog watches. It is also faster to check a digital watch than it is to check a clock hanging on the wall of the classroom. Make sure your watch is not a smart watch and does not make any noises. The double passage is roughly the same length as the single passages, but it tends to be slightly more difficult and time-consuming, as you will be asked to compare the two authors and their arguments. There is only one double passage in the section, so skip over it, complete all of the single passages, and then deal with this trickier passage at the very end. Not only will this save you frustration at the start of the section, but it will also be safer if you are running low on time; even if you only have enough time to read through the first author’s passage, you can still answer some of the questions (the ones that pertain to Passage 1 only). When reading a passage, don’t try to remember every small detail. Instead, try to get the main idea/gist of each paragraph. Make note of the overall point of the paragraph by jotting it down in the margins. There will not be a question about every fact or detail, so it is a waste of time to try absorbing everything during your initial read-through of the text. If there is a question about a fact or detail, you can refer back to the passage later on as needed. This will save you essential time. 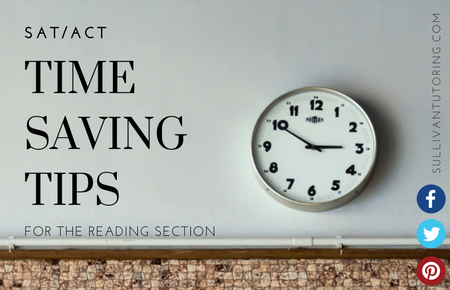 These tips will ease the pressure of finishing the Reading section on time, but the best tip of all: PRACTICE! There is really no way of getting around this one. The more timed sections you try beforehand, the more comfortable you will be with the timing on test day. Do you know the following math formulas? Want to receive our email newsletter, Sullivan Scoop? Text SULLIVAN to 42828 to join!